The MINIMAL bench is made of white reinforced concrete, travertine imitation, smooth and vibrato. The seat surface is smooth and treated with a protective anti-degrading polish for outside. It has 64 squared holes 40×40 mm. Marble and solid oak stool Modular system PLATEFORME is an open plan furniture system. To fit bespoke and customized solutions for all spaces. The pilotis allow to freely arrange the functions. Modern, versatile, generous, natural. A stone bench can be of many different configurations, from imposing geometric monolith to a light, dynamic structure. Traditional, modern and innovative designs are available. Stone benches offer unsurpassed durability and fit harmoniously into a wide variety of urban spaces, thanks to their materials and aesthetic qualities. They are common in gardens and parks, as well as at bus stations and along esplanades. 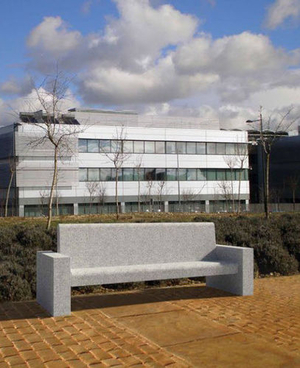 These benches are made from both engineered and natural stone, often sandstone, limestone, marble or granite. Some include other materials for the seat or the back, weatherproofed wood or metal, for example. Such combinations are often both comfortable and attractive.